FLYING: I can personally fly with your puppy and meet you at the airport OR YOU CAN ALSO FLY HERE. The families who have selected this option have been very happy. I have personally flown with puppies to Texas, Florida, Philadelphia, California, Maine, New York, Colorado, Puerto Rico, Nevada and more. 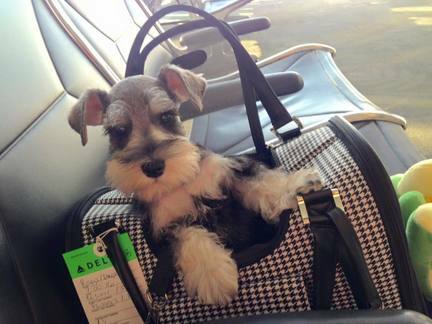 The puppy or puppies travel with me in the cabin of the plane in a soft carrier (I have videos on my facebook fan page). You and I meet in person at the airport. This is a wonderful option if you live far away. This total flight fee is $500/800 depending on the price of the flight for the lower 48 states and Puerto Rico. However if you live outside of the lower 48 the price might be more--we can verify the estimated fee in advance.